Oh. My. Goodness. These look so, so good. Brilliant. taste sensation alert! I am so making these little gems. Having worked as a pastry chef for several years, I'm embareassed to admit I've development an unfortunate dislike to dessert. Thanks for this brilliant (and kind of obvious, now that I think about it) dessert. Blue cheese cookies sound so good! Filling them with a fresh fig jam sounds even better! What in interesting flavor combination, again! 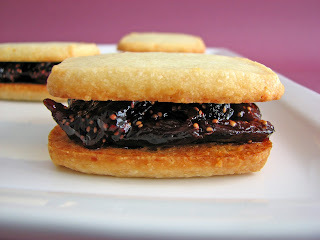 The fig and goat cheese cookies look delicious as well. I have to admit, I'd never eaten a fresh fig until last year. Better late than never. Okay, you are a God. Or maybe a Goddess. Whatever you are you rock. These are genius and I can't wait to make them. Hummmmmm, when is the next opportunity going to be? what an addictive, odd little cookie. i'll wait to see how they taste after a day. the texture of mine are rather soft, pleasantly so, but softish. i mean the color is incredible, so golden from the cheese-- the bottom and edges are just-crisp. but i wonder if i incorporated too much air while creaming the butter, cheese, and sugar. are you combining the ingredients like a short dough or do you want to incorporate air during the creaming? Hello everyone. Love your receptive comments. It's so fun to hear that people might enjoy my goofy little experiments. GooberNgrape, what a perfect way to describe this cookie - odd yet addictive. 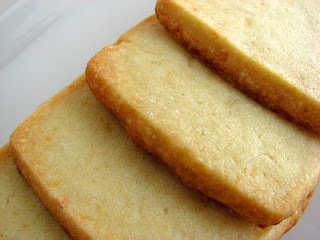 You are basically creating a shortbread, so don't want the air. You want creamy but not fluffy. I'm sorry if I didn't make that clear. 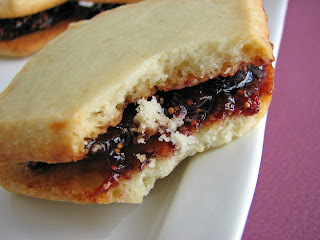 But they will turn soft if you fill them with the jam and store any of the plain cookies with any of the filled ones. I'm also wondering about the fat content of different blue cheeses and how that might affect the texture. The other thing that some people do is replace some of the flour with cornstarch for a crispier cookie. I didn't do that here because I think it affects the taste on my palate in a way that I personally do not prefer, but you could try that to see if you find it works better for you. How funny - I just finished a blue cheese and fig scone! These look fantastic! These cookies look fantastic. How far in advance can you bake the cookies before filling and serving them? The cookies can be baked a couple of days ahead if kept in an airtight container. In fact I think they taste better the next day. Once they are filled, they should be eaten because the cookies become soft if they sit too long after being filled with the jam. I am intrigued!!!... 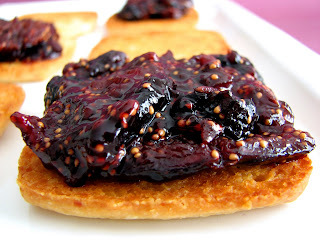 as so many times before..
chala, your jam sounds divine! I hope you get a chance to enjoy these.